Liberated mind is the greatest bliss. Nibbana is the greatest bliss. “Nibbana” has been changed to “liberated mind” in the Facebook version, but that’s fair enough, since it makes the verse understandable to non-Buddhists without significantly changing the meaning. It’s the use of the word ‘gift’ in the top quotation that I don’t agree with. It had always sounded odd to me (gift from whom? ), and when I finally came across the other version (which used ‘gain’), it made complete sense right away. 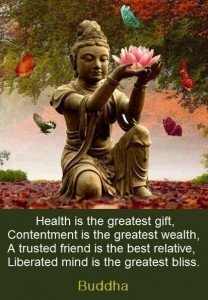 ‘Gain’ seems to imply that one’s earning of good karma resulted in the achievement of good health, whereas ‘gift’ makes it look like somebody blessed or granted you with it. Or maybe they just meant that it’s a gift to your present self from your past self and I’m just overthinking this. I hope that my english is not too bad. Thank you so much for this website, by the way. Your English is excellent, and you’re welcome for the site. The word “gift” in English doesn’t always imply a giver. To say, for example, that someone has a gift or is gifted no doubt originally implied God as the giver, but that no longer applies for many people. The same vocabulary can apply for many benefits people receive, from children to a sunny day. I can see your objection, but it doesn’t resonate strongly with me. I agree. “arogya parama labha”. Labha as you said is better described as “gain” or “profit”.